Show Recap – Music Industry Veteran Tony Michaelides Talks About Experiences and U2, Simon Cowell, David Bowie and More! #ThatBusinessShow ends week 21 today on 1250WHNZ and remember you can catch all shows On Demand all over the Internet including iTunes, SoundCloud, YouTube and http://www.tampabayradio.com and please follow me on twitter at Jamie_meloni for all the show updates! Today I welcome Tony Michaelides, a veteran of the music industry who has worked with countless music artists including David Bowie, U2, REM, Genesis, Dave Matthews, Bob Marley, Depeche Mode, Happy Mondays, Matchbox Twenty, The Police, The Pixies, New Order, The Stone Roses, Massive Attack, Neneh Cherry, Annie Lennox, Whitney Houston, Take That, Natalie Imbruglia, Westlife, P. Diddy, Elvis Costello, and Peter Gabriel. Tony, originally from England, shares many of his experiences with these artists with me during the show and even more so during the breaks and after the show, so much so a full day would be needed to incorporate many of the stories he has in the music business. On the show, Tony talks about his experience working with U2 when they were playing to small half empty bars and how they exploded onto the scene after the 1985 Live Aid concert that introduced them to the World. The story he shares is interesting in that Bono’s (lead singer) bandmates were all disappointed in his actions and performance on stage immediately after the short 3 song performance but it was those antics that drew the attention of the World. Tony also shares his insight on the record industry today and I ask him to elaborate on my theory that music piracy has re-directed the resources of the record labels so much so that new talent development has suffered thus leading to the musical void that exists today. Personally I have felt for the past decade and more that there have been no Rock bands that will be listened to for ages to come in the way bands such as Led Zeppelin, Pink Floyd and Genesis. Tony elaborates on this very well during our second segment. Tony’s experiences in the music industry have expanded over 30 years and he talks more on the show about Simon Cowell, David Bowie and touches on many more. 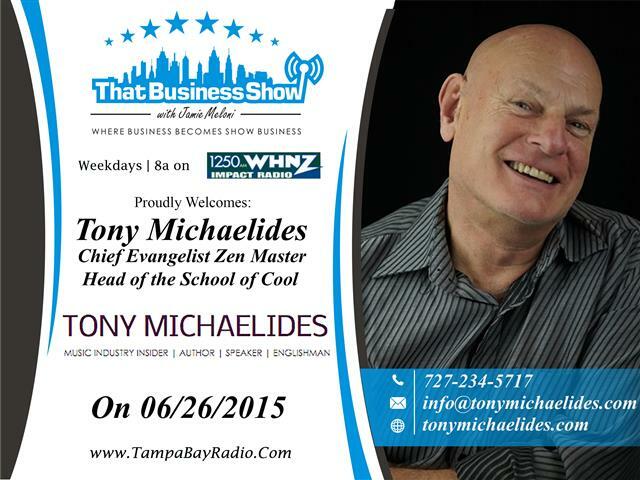 He has written a book as well on his life and the music industry experiences called The Insights Collection and is available on his website at http://www.tonymichaelides.com!